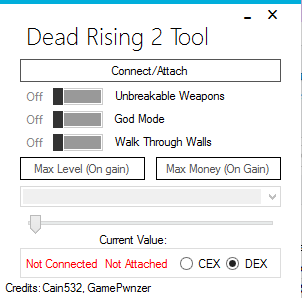 Here is my Dead Rising 2 Tool! A few nice features, many to come. All features work online. The Walk Through Walls is a tad glitchy at times, and the move speed needs to be re-adjusted after entering a new area. Hope you all have fun with it!!! Hit me up if you ever want to play!! Forever ago there was also the fun of people modding items and moving things around on the levels. I remember an old simple mod to put all of the mega weapons in your safe house so you could choose any item of your choice from the start every time. There's also a useless extra thing you could try finding if you have a lot of patience. I remember there being a debug menu and I managed to get it working on the PS3 by modifying a file, but I was much dumber back then. That was over 4 years ago. The attached file gives you possibly the whole debug menu, I'm not certain. I don't remember the debug options in there to be very useful. If you are ever bored you could try making a tool to put items in place, modify them, or enable that debug menu. I didn't even check those links, somebody might have already done so too. I was messin' with the debug menu, nothin much of interest there. I was also trying to have the debug menu work with RTM instead of having to edit the actual file but I kinda gave up on that. I'll check the other stuff out though, thanks for the post!! Which GameID and version is this tool for? BLUS30439 01.00?